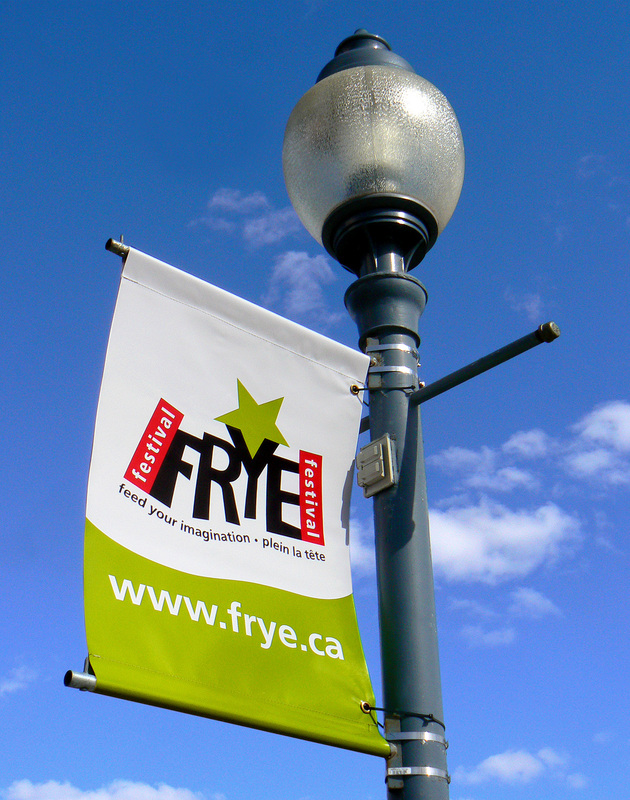 The Frye Festival banners are up on Main Street, Moncton, which is a sure sign of spring (or that it may snow again…just one more time!). Programs have been inserted in 100,000 newspapers all over the region and giant billboards encourage everyone to visit www.frye.ca for all the Festival details. This year all 31 authors (every single one!) will be visiting schools, which means that more than 10,000 kids will have the opportunity to meet an author in their classroom, library or auditorium. I just counted and we have 56 different non-school events this year, which must be a record. I drove to Halifax yesterday (wake-up call, 3:00 am!) for a 4 minute live interview for Breakfast TV – you try and cover 56 different events (workshops, round tables, book clubs, dialogues, lectures, readings, etc.) and 31 authors in four minutes (after driving 3 hours in the dark!). Northrop Frye is of course our inspiration and his commitment to an informed and civil society lies behind everything that we do, but it is sometimes difficult to get the message out. We don’t want to lose Frye in all that we do and one tangible example of Frye’s continuing presence in Moncton is a project I’m just now discussing with Moncton’s mayor, George LeBlanc. I’ve had a long-time dream of creating a bronze sculpture of Frye, sitting on a park bench, casually reading a book. He would be life-sized and hardy (I see kids climbing on him and tourists getting their photos snapped with him). The inspiration for this idea came recently when we commissioned an artist to create a prize for our inaugural “Frye Academy Award” – you should see the gold Northrop Frye bobble head that he created (he is waving and has a jaunty stance!)! If my head is not too “Frye’d” by Sunday, April 25, I will post a photo of the bobble head prize, because I know you will all want one! Anyway, once the Festival is over I hope to start work on getting an enduring tribute to Frye created. Better get back to work…still lots to be done! The Frye Festival was officially launched today at Moncton City Hall. We had lots of politicians make appearances (Premier Shawn Graham, Senator Rose-May Poirier, MP Brian Murphy, Municipal politicians, etc.) so that generated lots of media coverage (and in fact, the first time the RCMP has ever called us about protestors – we thought maybe they thought our authors might be radicals, but alas, it was about the Premier!). As always, it is tough to get the story out there, but somehow, the media is coming out in droves this year. The hook? Volcanic ash. Yep, we have had some cancellations due to the cancellation of two European authors’ flights. This is something that they can understand and then, they actually pick-up on the Festival story. Who knew? We’ve dealt with cancellations for SARS, 9/11, fog and snow, but volcanic ash is new! While today was the official launch, we had a wonderful event on Saturday at The Bay. Sandwiched in between women’s fashions and lingerie we displayed more than 200 K-Grade 4 student creations. All the kids received an invitation to attend, pick-up a certificate, a Festival t-shirt, a pass to Magic Mountain and the opportunity to shine in front of their family and friends. I brought my son along to help out and he simply couldn’t believe how excited the kids were. He is a hockey player and gets accolades everywhere he goes (our community is truly hockey obsessed – it hasn’t changed much on that front since Northrop was here! ), but this event is one of the few that gives young creators the opportunity to celebrated by their community. Tonight I’m looking forward to Prelude: Emerging New Brunswick Authors. We have six up-and-coming authors (three English, three French) who have all just recently published their first books. I love this event. We have so much for kids (K-12) and so much for commercially successful authors, but it is nice to nurture our own local authors. This entry was posted in Frye Festival, Guest Bloggers on April 19, 2010 by Guest Blogger. Congratulations to our friends and colleagues in Moncton! We wish you the very best, and look forward to hearing from you. We wish we were there!! The Official Launch of the Festival is this morning at 11am, with bells and whistles, musicians, sponsors and politicians, and our own Poet Flyé, Jesse Robichaud, whose task is to follow the festival for a week, make notes and come up a long poem to present at the closing next Sunday. Since Jesse is also a reporter at the local newspaper, we’re assured of some good coverage. There’s snow on the ground, so it must be Frye Festival time. We always get at least one snowstorm during the festival, or at least a dusting. In 2001 the plane carrying Robert Bly and Marie-Claire Blais had to be diverted to Halifax because of a major snowstorm. They finally got here in the early morning hours, in time for their events. We’re lucky that we haven’t lost any authors to the volcano. Craig Stepenson, scheduled to give a talk Wed. evening (“Reading Frye Reading Jung”), fortunately decided to visit friends in Toronto before coming to Moncton. He left Paris last Wed. or Thur., before flights were grounded. I’ll meet him tomorrow and drive him to a local school, for a ‘school visit.’ It will be interesting to see how a Jungian Analyst based in Paris, France, addresses a class of high school students in Riverview, New Brunswick. The main event today, after the Official Launch, is called Prelude: Emerging Writers of New Brunswick, featuring 6 young writers, 3 French, 3 English, each with one or two books to their credit, just beginning their careers. 8pm, we’ll be there. Tomorrow things start to heat up. This entry was posted in Frye Festival on April 19, 2010 by Michael Happy.